The high specialization and investment in process innovation provide a high quality product. The attention to customer needs is also expressed through the implementation of a Quality Control Program of each stage of the design and production. 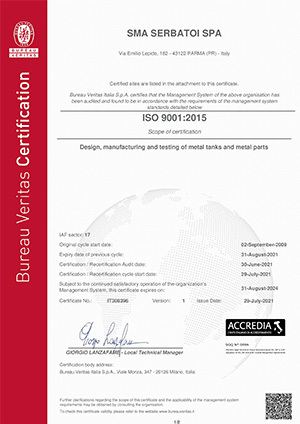 For this purpose, SMA has implemented a Quality Management System ISO 9001: 2008 certified. Simple pressure vessels for road vehicles 2014/29/UE Directive EN286/4 I.C.E.P.I. Simple pressure vessels for general purpose 2014/29/UE Directive EN286/1 I.C.E.P.I. Pressure vessels containing water and air 2014/68/UE Directive EN 13445 I.C.E.P.I.